What if I use a fake ID? 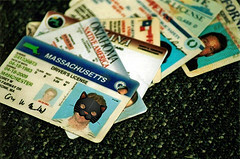 Using a fake ID is against the law and is either a misdemeanor or petty offense. It doesn′t make any difference why you′re using it or where. You may be trying to get into an age-restricted club, movie, or pool hall, or even enlist in the armed forces. If you′re caught using a fake ID and don′t admit to your acts, an additional charge of false reporting may be filed. False reporting is lying to the police. Any attempt to mislead a police officer to avoid getting into trouble usually backfires. The court may take into consideration your statements when first contacted by the police. If you break the law, you′re better off being honest and straightforward when questioned. In 2011, Arizona passed a law against using fake IDs to obtain tobacco products including cigars, cigarettes and cigarette papers, and chewing tobacco. The crime is a petty offense that carries a maximum penalty of $500.00. Speaking of personal identification and the need to carry one with you when out in public, consider what happened to 21 year-old Samantha Zucker in October, 2011. Samantha was a senior at Carnegie Mellon Unversity. She was with a group of classmates on a visit to New York City looking for employment possibilities in the design industry. She and another friend were stopped in a park at 1:00 a.m. and told that the park was closed. They were both given trespassing tickets. Her friend had his driver’s license and was allowed to leave. Samantha’s wallet was in her hotel room, two blocks away. But she wasn’t permitted to get it. Instead she was arrested, handcuffed and taken to the police station. After 36 hours, she was released and the ticket was dismissed by a judge. A number of police snafus and administrative errors resulted in her lenghty incarceration. Lesson here? Always carry some form of ID when out with your friends or by yourself. The police are authorized to ask your name and for identification. This, admittedly, is a rare case but it happened and could have been avoided. Dear Mr. Sloane: If you would provide us a citation to the case, we’ll take your suggestion and read the opinion. Thanks.